We are already coming to the end of the 3rd month in 2016, this year is going unbelievably fast! I can not believe it. March was a bit of a hectic month, hence why there has not been a lot of blog posts this month, but April will be full of more blog posts. What have I been loving this month? This month I was able to receive a Jo Malone Complimentary Hand and Arm Massage, it was an interesting and different experience that I thoroughly enjoyed but also would recommend. On my trip, I fell in love with the Wild Bluebell fragrance and the Mimosa and Cardamom fragrance as well, which is on my current fragrant wishlist. I have been also loving the MAC False Lashes in Extreme Black for my bottom lashes, as I have it in the sample size I just thought that it ould be appropriate to use for them. They lengthen my eyelashes very well and create the full effect. For my skin, I have been loving the Clinique Smart Serum which I also got in a sample size. Using this twice a day has improved my skin a lot, brightened up and evened my skin out extremely well. It's everything that my skin was in need of, so now when I don't use it I feel so weird and lost. 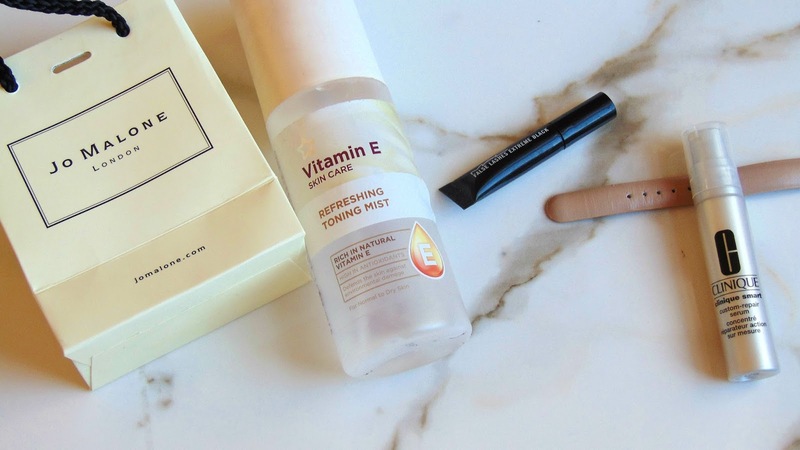 To finish off my daily skin routine, I spray my Vitamin E Toning Mist which I have been raving about for the past couple of months especially on the blog. I use this all the time but only in the evening as it gives my skin a deep moisture boost throughout the night. Ever since, using this mist my skin has never been dry nor irritated by this product. I have a post coming next week on all the blog posts that I have been loving this month, so I'll keep that for a separate post and talk about my favourite bloggers of this month. I have been loving Isabelle Kate, her makeup is beautiful and I love reading her blog. Another blogger, I have been loving is CharmedCharlee her photography is just gorgeous and I can't get enough of it. Discovering Kelsey on A Girl Obsessed's blog, I have fallen in love with the blog A Balancing Peach - worth the scroll through. What have you been loving this March?